All business owners, irrespective of industry, must think about marketing strategies when it comes to website design. From a recent survey conducted, business owners believed that simply putting a press release on the website is constituted as marketing - is it really? Deploying Inbound Marketing techniques within your inbound website design can ensure that your efforts are not wasted. The very definition of Inbound Marketing was derived by HubSpot in 2003, where it was identified that the core of Inbound Marketing is all about creating and sharing content with the world. A much more refined definition is that the content appeals to your ideal customers or, your buyer personas. The concept behind this is to attract your ideal customers with engaging and awesome content that keeps them coming back for more to eventually nurture and convert them into long-standing brand ambassadors. Bring in targeted traffic where you're visitors are more than likely to move through the sales funnel. Attracting the right people can be achieved in a number of ways, regular blogging, targeted SEO and social media engagement. Collecting contact information so people keep coming back to your site over and over again is key. Optimise your site with online forms, landing pages and calls-to-actions. The next logical step is to close the deal and get those leads purchasing from you! You can do this by focused emails, customer relationships management tools and autoresponders, all of which the guys at HubSpot are pretty handy at! Ensuring that your content is the very best is key. There's no point in creating content that is rubbish! The key here is to not just provide your visitors with information, instead, delight them! Conduct surveys to find out exactly what your audience wants, customise your CTAs that recognise your visitors in their conversion cycle and listen and answer customer questions on social media. So now that we have an understanding of Inbound Marketing, we can now begin to look at how we apply this to an inbound website design. Before embarking on a new website design project, or even considering a re-design, you need to understand the content you are intending to publish. We've seen it all too often where content is the last thing on people's mind, it is evident that the design of the website is crucial, however people need to read about you! This can have a detrimental effect at the end of the project. Through not considering content, it may not flow right with the design, or there may be a lack of logic to how the content is displayed that corresponds to the design. Yes, your site may still work, however, it would work miles better if you considered content first. Know where your companies features and services are. Know where you will offer forms, special offers and calls-to-action. Write all of your site's content first, then figure out the design to accommodate this. In today's society, everyone has a smartphone. Ensuring that your site is mobile optimised is crucial within the Inbound Marketing methodology. Creating a mobile version of your website or using a responsive design to ensure that your website automatically resizes and looks good on all devices is key. Understanding the path you are taking is an important decision that you must undertake at the very start of the design process. Including calls-to-actions and offers are essential components when using Inbound Marketing techniques for web designers. Without including offers within your website design, do you really think your visitors will come back to your site? Using a theme or building a layout that incorporates calls-to-action. A good CTA will stand out from the remainder of the page. Ensure you use contrasting colours and consider using this as part of a lead capturing form. Providing Downloadable Content. Encouraging interest is easy by providing content that is downloadable. Completing a sign-up form can lead your prospects into downloading the premium content offering as a free resource which will encourage your visitors to act. The use of lead capturing forms is pivotal to any inbound website design and inbound marketing strategy. You need to ensure that the information you capture is of high quality and therefore using the right tool is essential. Throughout the design stage of your project, you need to consider the best location for your lead capturing form, whether this is in the sidebar, at the bottom or top of the page, or mid-way down, you have access to numerous plugin options to ensure that your website is optimised to gather the very best information. As part of the inbound strategy, ensuring that your contact details are accessible in pretty much every location is ideal. The idea behind this is that you don't want your visitors working to find the information, you need it accessible and quick to find. Inbound marketing is all about making the user experience intuitive and useful. If you are dealing with local businesses, the contact information should be displayed in the header and at the top of the sidebar and footer. The addition of a contact form is also crucial so your prospects don't have to come back later to leave you an email. It is pivotal to make it easy for your prospects to contact you right now! The role of social media is pivotal in inbound marketing. Attracting the attention of your prospects and encouraging them to convert requires you to build a successful social media presence. Regular interaction on social media sites is important but you also need to leverage your social proof. Ensure that on any website design project, you integrate your social media through the use of social sharing buttons and share counters. This can indicate that your content is popular and other prospects have found you engaging. A further way to embed this into your site is through testimonials. Many companies choose to place testimonials on a separate dedicated page, however, you can make significant use of these by incorporating them into your site's regular content. The insertion of testimonials throughout your content helps to add authority to what you are saying and can enhance your reputation whilst prospects browse your site. We are all aware by now that content is king, however, keeping the content fresh is pivotal when it comes to inbound marketing. Invest time in a content strategy that is tailored to your business and that works best for you. We aren't saying post every single day of the week, but posting well researched and in-depth articles once per week will be beneficial. Not only does it boost your reputation, but it does so far as building your search engine traffic, boosting your page rank and gives your prospects the opportunity to see what you're about. Creating content that is informative and entertaining is key. Our attention spans are short so capture and engage through substance and excitement. Making your website visitors feel welcome is important. If you're going towards an agency position then HubSpot is the perfect tool to analyse how people are landing on your site and their behaviours in the past. The majority of businesses have concerns over budgets, and therefore HubSpot may not be right for you at this specific time, however using the free CRM software can add value in the interim whilst you begin to build up your business. Always test what you are doing, whether that's deploying a new inbound marketing strategy or utilising your traditional marketing practices, testing is the key to success. Look at how small design changes affect your conversions. You can be there for a long period of time guessing, however, if you don't have the right data you really are just messing about! Creating and deploying A/B Tests to see the design elements that work is advisable. Splitting two CTAs, two navigational menu colours etc to see what works helps and you can take the winner from this and implement the right one that generates the results you want from your prospects. The goal with this is to always evolve with your prospects. Hone in on what works well for you, what looks better and what really engages your site's visitors. Launching a new marketing strategy alongside your inbound website design is no walk in the park. Ensuring that your website design and your inbound marketing strategy is perfectly aligned will always reap rewards for what you are trying to achieve. Trying out a few of the things above can make a big difference to your results, so remember, always test and never guess! 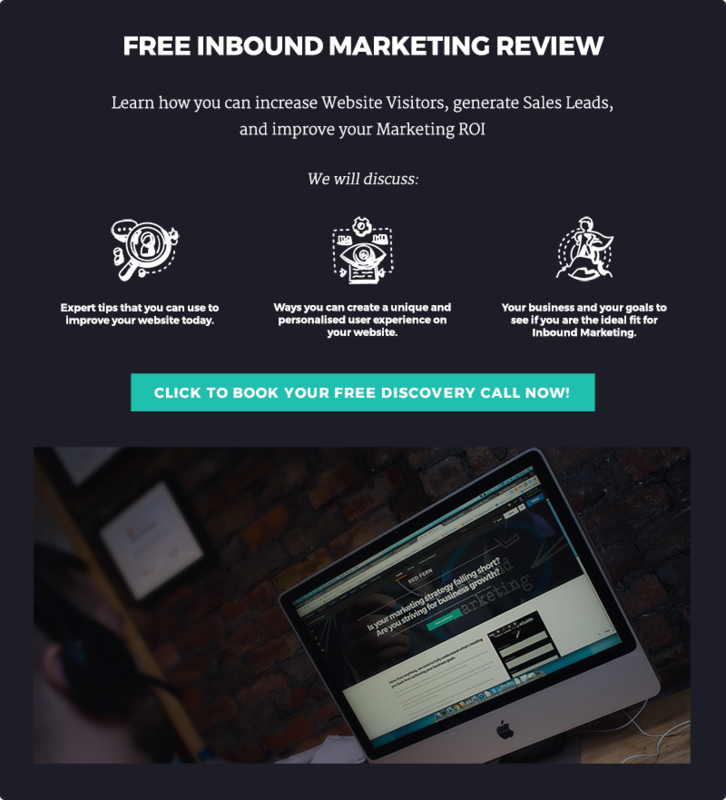 Begin to create your ultimate Inbound Marketing website now!